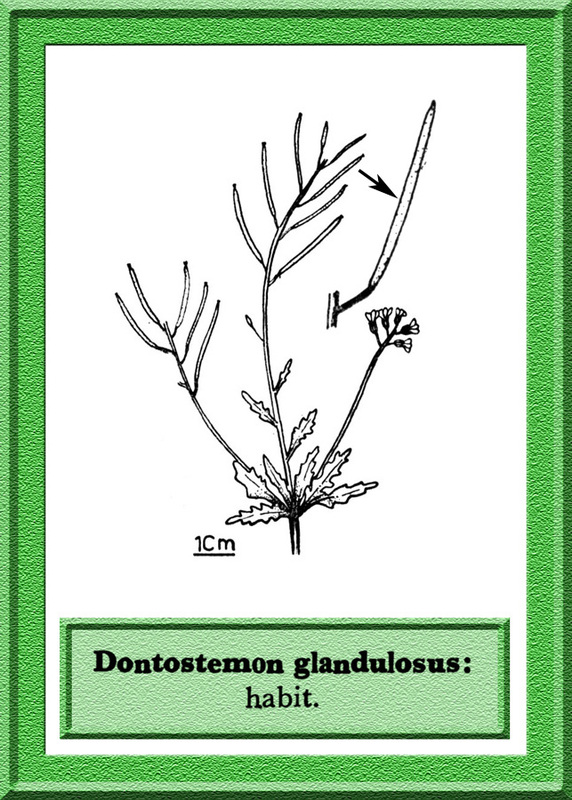 Dontostemon glandulosus (Kar. &Kir.) O.E. Schulz in Notizbl. Bot. Gart. Berlin. 10:554. 1929. in Engl. & Prantl, l.c. 557. Arabis glandulosa Kar. & Kir. Sysymbrium glandulosum (Kar. & Kir.) Maxim. Torularia glandulosa (Kar. & Kir.) Vas. Torularia glandulosa var. pamirica Vas. Short annual, erect to spreading or suberect, 4-10 (-20) cm long, sparsely hairy with simple and glandular hairs. Basal leaves rosulate, narrowly spathulate or linear, 10-25 mm long, 3-5 mm broad, entire or sinuate-toothed. Racemes 10-25-flowered, up to 6 cm long in fruit. Flowers 3-4 mm across, white or pinkish; pedicels up to 8 mm long in fruit, ascending, glandular. Sepals 2-2.5 (-3) mm long. Petals 3.5-4 (-5) mm long, c. 1.5 (-2) mm broad, apex subemarginate or subrounded. Stamens c. 2.5:3 mm long; filaments not denticulate or appendaged; anthers c. 0.5 mm long. Siliquae linear, subcylindrical, (15-) 20-25 mm long, c. 1 mm broad, subtorulose, glandular; valves with 1 (-3) distinct veins; style minute with short depressed stigma; septum not veined; seeds 10-15 (-18) in each locule, c. 1 mm long, oblong-ellipsoid, brown. Type: C. Asia, Sarvchan, Karelin & Kirilov (LE). Distribution: Tibet, Kashmir and W. China.